2 years old is such a fun age! Linden has finally started to show a preference for different toys and books and likes certain things over others. Some of his favourite toys to play with are cars and he especially loves construction trucks. He got a book for Christmas all about construction sites and it has been a favourite bedtime read ever since. Every time we pass road construction in the car, he pipes up from the back seat with an enthusiastic “woweeee”. So, it was a pretty easy decision to go with a construction theme for his birthday party. With that sorted I turned to the World Wide Web for some inspiration! Linden is celebrating turning 2! I love using Evite.com for all of my invitations. They have a great selection of free styles and the site makes keeping track of RSVPs a breeze. With everything in one place it is simple to send reminders, group message guests of any changes, and set up notifications when guests view invites. It tells you how many people are coming and allows you to create an email bank so you don't have to search for addresses year after year. I can't recommend this site enough. Overall, I wanted to go for a yellow and black colour scheme to match the construction vibes of the party. My first stop was to the dollar store where I purchased the plates, cups, napkins, and cutlery. I also bought an extra white table cloth for over the top of our side table. On the Party City website I ordered yellow paper lanterns, the construction zone table cover, the construction party swirl hanging decorations, the wood scene backdrop, the caution: keep out tape, the construction cone candles, three gold number 2 balloons, black and yellow crepe paper ribbon, and black and yellow balloons. Along with the party favour supplies that I will talk about later in this post, I also purchased a party zone construction themed banner from the Oriental Trading website. I printed out a bunch of construction work signs and cut them out to add thematic touches that really brought the decor together. I like to keep the decorations simple but impactful and I think the final result turned out exactly how I had hoped. There was no mistaking this party for anything but a construction theme. Using cheaper supplies such as the printed pictures and the balloons allows you to really enhance the more costly pieces that you invest in. Le Petit Croissant Sandwiches (Medium): A mouth-watering selection of roast beef, chicken and ham served with havarti, cheddar and Swiss cheese on a flaky buttery mini croissant and garnished with grape tomatoes. 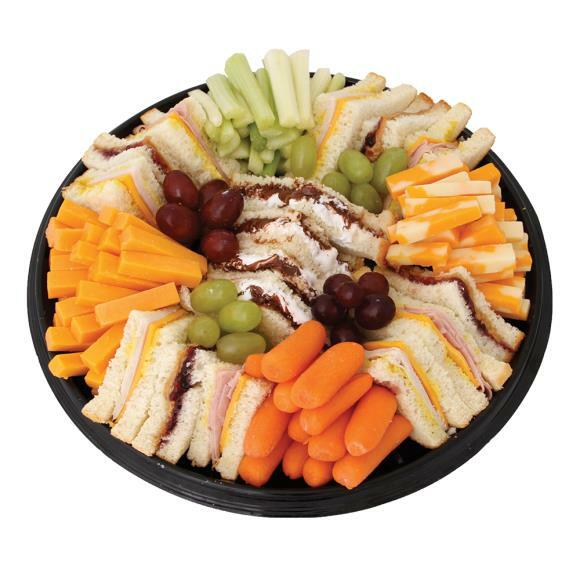 Family Celebration (Medium): A perfect tray for all ages: ham and cheddar, chicken and cheddar, peanut butter and jelly, fluffernutter sandwiches, and finished off with slices of cheese, celery, carrots and grapes. Fresh Fruit Platter: A harvest of summer fruits (while available)! Strawberries, cantaloupe, honeydew melon, juicy watermelon, pineapple, red and green grapes, orange and kiwi fruit arranged around a delicious strawberry and yogurt dip. 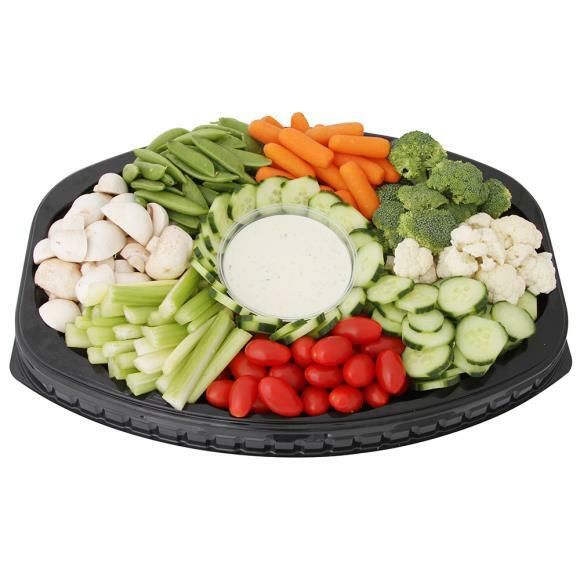 Love Those Veggies: A medley of fresh vegetables including baby cut carrots, broccoli florets, celery, grape tomatoes, cauliflower, cucumber, mushrooms and sugar snap peas, arranged around a bowl of zesty ranch dip. The rest of the sides and snacks served were bought from Wal-Mart. Worms and Dirt Pudding Cups: These were super cute and went perfectly with the theme. I used chocolate pudding and topped them with Oreo crumbs and added 2 gummy worms. Maltesers: To look like rocks and boulders. Twix Bites: To look like rocks and boulders. 2 take 10 coffee packs from Tim Hortons: It is always worth it to buy coffee because of the sheer quantity you need for 15 adults to stay awake at a 2 year olds birthday party on a Saturday morning. I would love to be the mom who has the time to make a birthday cake. But I am the mom who spends all her time planning parties instead. So, making the actual food has to take a back seat. That’s okay. We can’t do it all and we have to be able to prioritize and know our strengths. Instead, I ordered from Safeway which made it a simple one stop shop to pick up the majority of the food. Safeway chocolate sheet cake with vanilla icing: Safeway has a variety of different themed customizable cakes and luckily they had an awesome construction option. It looked amazing and turned out exactly how I had hoped. Adding the construction cone candles and the gold sparkly 2 put it over the top. As you can tell from the pictures below, Linden enjoyed every bite of his slice. When it comes to a 2 year old birthday party it is important to keep the kids busy and entertained. Having different stations set up that the kids can go to as they please always proves to be a good choice. The kids were so involved with what they were doing that there were no fires needing to be put out. This gave the parents ample time to catch up and enjoy each other’s company. Bouncy slide: We were lucky enough to be gifted a former next door neighbour's bouncy slide. They live next to my parents in Steveston, BC, and their kids are now in high school so they happily handed it down to us. Bouncy slides are always a hit and this one was no different. I think every child ventured down to the basement at least once and took a ride down the slide. Orbeez/Water beads: These are tiny absorbent seeds that grow when you add water. They become squishy balls that are a sensory experience like no other. I bought a package of 20,000 beads, in all black, on Amazon. There were more than enough balls to fill the bottom 2 inches of our water table. The black colour made it look like mud and with the addition of some utensils and construction trucks it was an absolute thrill for the kids. Kinetic sand buckets: You can’t have a construction birthday without sand and there is no better sand than Kinetic sand. Kinetic sand looks like regular sand and can be moulded into different shapes. What makes Kinetic sand extra special is the fact that it does not stick to other materials, doesn’t dry out, and is super easy to clean up! This made it a great addition to the party. Add some construction trucks and you have a great little station to occupy little hands and growing minds. Road track: We have a construction ride on truck so I thought I would put it to good use. We laid down no residue duck tape with white masking tape dashed down the middle, to create a road around our dining room table. Our friends brought a second vehicle and I was shocked by how many kids took a spin through our dining room. Tattoos: I ordered these tattoos through Oriental Trading to go into the party favours. With the extras, I offered to put them on the children during the party. Tools and workbench: You can’t do construction without tools so I took to Amazon and purchased a little tool set with workbench. This was our “gift” to Linden as it was something we didn’t have and an item we knew he would get a lot of use out of. Toy room: Of course, we opened up our toy room and let the kids play with other toys too. Although many kids went in and played momentarily, the other party stations kept the kids entertained for the majority of the party. The toy room was great to supplement what I already had but wasn’t necessary. As always, I try to make favours something the kids can use in the future. I avoid doing a bunch of treats, especially at such a young age and after getting them high on sugar from cake, candy, chocolate, and juice. I also try not to buy the typical party favour items that although are highly entertaining in the moment, are forgotten the very next. This year, I purchased everything through oriental trading and loved the end result. Each child got a construction hat, work goggles, construction cone straw cup, construction car tattoos, and a bag of rock chocolate and worms. I still see kids wearing the items and using the cup through instastories and that makes it totally worth it! Thank you to everyone who joined us in celebrating Linden’s 2nd birthday!